Hydrangeas (Hydrangea macrophylla) are a widely planted landscape shrub in Oklahoma. They grow to 6 feet tall and 10 feet wide under optimal conditions. Hydrangeas produce large globe-shaped flower heads that are made up of hundreds of smaller pink, blue, green, purple or white flowers, depending on the variety. The flowers are long lasting and are often used in fresh or dried cut flower arrangements. The most commonly grown mop head varieties of hydrangeas are not native to Oklahoma and need some care to survive the intense heat of an Oklahoma summer. Locate hydrangea shrubs where they are protected from the hottest afternoon sun. Morning sun exposure until noon is best. This can be accomplished by planting on the east or north side of a shade tree or structure. If the hydrangea shrubs are already planted, you will need to provide shade for protection or transplant them to a new location. Hydrangeas planted in full shade with no sun exposure will become leggy and bloom production will suffer, while those planted in full sun will struggle to survive. Look at the area where the hydrangeas are planted. Hydrangeas grow best in moist soil but will decline if left sitting in waterlogged or boggy soil. If the area is not well drained, dig a trench with a shovel so water does not collect around the shrubs. Place a 2-inch layer of compost over the planting area around the roots of the hydrangea shrubs. Use a rake to spread the compost around the soil surface without disturbing the shallow roots of the plants. Add a 1-inch layer of mulch around the root system of the hydrangeas to conserve moisture and prevent weeds from growing. Every spring, rake out the mulch layer and add another inch of compost around the shrubs before replacing or adding new mulch. Water the soil around the hydrangea shrubs as often as needed to prevent the shrubs from wilting in the afternoon. When watering, apply the water to the soil around the roots. Do not spray the leaves or flowers with water. Wetting the plant increases the chance for fungal and mildew diseases. Prune hydrangeas right after the bloom period if pruning is needed. Pruning hydrangeas late in the season can affect the next year's bloom production because hydrangeas bloom on wood established the previous season. Always prune out dead wood. 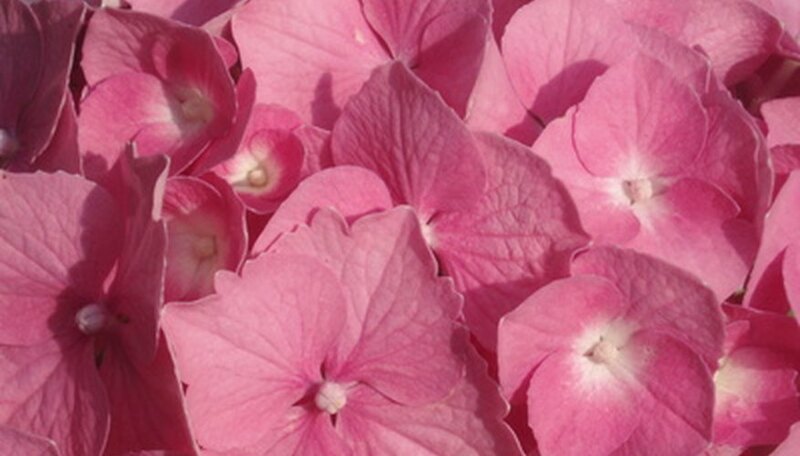 Fertilize with a fertilizer that says on the label it is for hydrangeas. Follow the directions on the package carefully. Too much fertilizer can prevent the hydrangea shrubs from blooming. Fertilize beginning in April, then on a schedule recommended on the fertilizer label. There is no need to fertilize once the plants become dormant in fall, so your last fertilizer application should be no later than September.